Senior Iranian leaders verbally attacked President Donald Trump late Tuesday and early Wednesday following his first United Nations address, in which the U.S. president harshly criticized Iran for its support of global terror operations, according to regional reports. Iranian political and military leaders, including the country's president, mocked Trump for his criticism of the Islamic Republic and threatened military repercussions if the United States decides to leave the landmark nuclear agreement, which Trump hinted could be a possibility on Wednesday. In brief remarks to reporters following a meeting with Palestinian President Mahmoud Abbas, Trump said, "I have decided" on whether to designate Iran in violation of the nuclear deal, a move that would set the wheels in motion for the United States to leave the agreement and reimpose tough sanctions on Tehran. When pressed on the issue, Trump smiled and said, "I'll let you know what the decision is." Iranian leaders have vowed a harsh response should the United States move to leave the deal, and have hinted at more aggressive military moves against American interests in the region. Iran will seek to boost its military capabilities and directly confront the United States, according to these Iranian military and political leaders. "We won't chicken out for cowboy-like acts of Trump," Brig. Gen. Seyyed Massoud Jazayeri, deputy chief of staff of Iran's armed forces, was quoted as saying on Tuesday in reaction to Trump's U.N. speech, which singled out Iran and its nuclear program as a chief global threat. Trump's "remarks recount how the weak and incapable government of the U.S. has fallen in melancholy after keeping the dream of being the world's superpower," Jazayeri was quoted as saying in Iran's state-controlled media. Trump's remarks have spurred Iran to further increase its military capabilities, according to Jazayeri. "For facing a country whose president overtly and blatantly shouts at the lectern of the U.N. that it would ‘totally destroy' with its military power, no option is left but to strengthen the defensive infrastructures," he said. Iranian President Hassan Rouhani offered similar remarks, telling reporters that Iran would "be victorious" in any outcome, even if Trump moves to end the nuclear agreement. 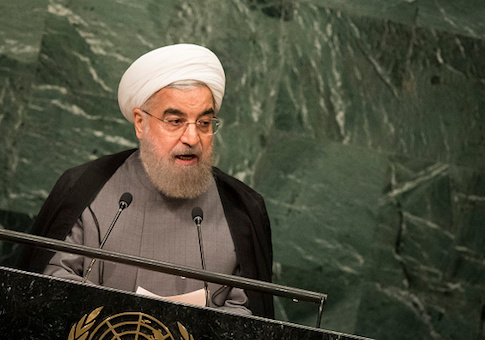 "Iran will be victorious, regardless of what happens" with the nuclear deal, Rouhani said. "If the U.S. backs out of the deal, they will suffer loss and if they remain committed, they will sow benefits. We are ready for any situation and there is no obstacle to our advance toward our objectives." Mohammad Ali Jafari, commander of the Iranian Revolutionary Guard Corps, or IRGC, said that Iran is already moving to enhance its military capabilities and face down the United States. "Time is now ripe for correcting the U.S. miscalculations," Jafari was quoted as saying after Trump's speech. "Now that the U.S. has fully displayed its nature, the government should use all its options to defend the Iranian nation's interests." "Taking a decisive position against Trump is just the start and what is strategically important is that the U.S. should witness more painful responses in the actions, behavior, and decisions that Iran will take in the next few months," he said. Other senior Iranian leaders, such as Rouhani's deputy chief of staff, took to Twitter to express anger at Trump and mock his remarks. "A person who takes the presidential office with deception and undemocratic behavior, will be unable to differentiate between delivering speech in the United Nations from the rough American football." Hamid Aboutalebi, a senior Rohani aide tweeted. Iranian Foreign Minister Javad Zarif, the main official who helped cement the nuclear agreement, described Trump's remarks as "ignorant hate speech" on his Twitter feed. This entry was posted in National Security and tagged Donald Trump, Iran, United Nations. Bookmark the permalink.